ALL FRAMES 40% OFF LISTED PRICE. OFFERS ACCEPTED. 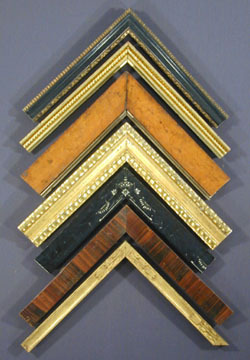 Antique picture frames are at last beginning to receive the attention they deserve. The best of them, after all, are works of art in themselves. Mounting your artwork in a frame of its period makes the difference between framing that is simply adequate and framing that will make your artwork sing. Click below on an image to take you to a different era and style of frame design.